1907 – Colin Wood is born quite literally into the woollen industry at Yorkshire, England. Colin’s grandfather and uncles had founded their own Green Lane Mill in the early 1880s. 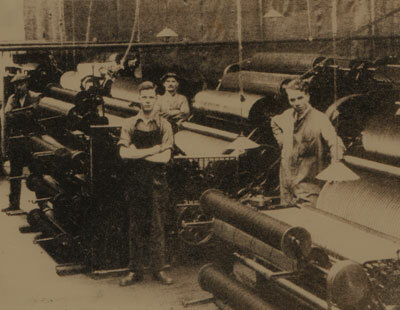 1920 – Colin begins his apprenticeship at the Washpit Mills in the original Yorkshire spinning area of Holmfirth. 1931 – The Great Depression prompts Colin to look overseas for work. He applies for a job at the Oamaru Woollen Mills, New Zealand. 1934 – Colin’s son, Peter, is born. 1944 – Colin leaves the Petone Woollen Mills and sets up a wool spinning factory of his own. This marks the beginnings of the company that would become Woolyarns. 1945 – Colin’s son, Jim, is born. 1946 – After a fire destroys the property, Colin forms a partnership with Tommy Wells – Wellwood Ltd. In 1953, Colin buys out Wells and changes the company’s name to Woollen Industries Ltd.
1956 – Peter joins his father full time in the business. 1958 – 59 – The company moves premises. 1965 – Jim joins the company to ‘take over the office’. The company focuses on producing yarns to customer specifications. In time it would become a major supplier to local knitting mills. Late 1960s – Jim travels extensively to market the business. The company begins exporting yarns to Australia, then Hong Kong and then Mauritius. The 1970s – The company continues to expand internationally. 1977 – The company receives the Trade Promotion Council’s Export Award in September. That same year, the company changes its name to Woolyarns Limited. 1979 – The company is awarded a High Priority Status Award for its outstanding contribution to New Zealand’s economic growth. 1992 – Jim dies suddenly at just 47. 1992 – Research and development leads to the development of new yarns incorporating merino and New Zealand Brushtail possum fibres. The company begins commercial spinning of merino possum yarn. 1995 – Woolyarns marks its 50th anniversary. 1999 – As competition from China changes the face of NZ textiles, Woolyarns recognises that it needs to become a niche market supplier. Possum yarn manufacturing production expands and the fibre becomes a mainstream product offering. 2003 – Woolyarns launches its Perino possum wool brand. 2004 – The company produces its first carpet yarns. 2006 – New machinery is installed with Chem Setting capabilities. 2007 – Woolyarns launches its Zealana hand knitting brand. 2010 – INZpire carpet yarn brand launched. 2011 – An upgrade in fine spinning for possum blended yarns means Woolyarns can now spin to Nm 36/2. 2015 – Woolyarns Perino possum wool brand, Perino re-entered the International market by exhibiting at Pitti Filati and Spinexpo trade fairs. 2017 – Woolyarns signs an agreement with IAFIL Industria Ambrosiana Filati S.p.A to exclusively distribute Perino yarns in Italy and France. 2017 – Woolyarns restructured. Selling the carpet plant and their hand knitting capabilities. The Zealana brand was sold to Extraordinary yarns in Australia, and the factory continues to manufacture the yarns.